– If you installed Google App Sync: Updates are checked for and downloaded to your computer automatically. – If your administrator installed Google Apps Sync: Updates are downloaded to your computer automatically, if your administrator enables automatic updates. Productive discussions can help teams write better documents, and last Wednesday we introduced improvements to how you can converse about documents within Google Docs. Profile pictures and timestamps make it easy to see who made a comment and when, and you can direct a comment to someone using an @mention. You can follow discussions with notifications right in your inbox—and even continue a discussion from your inbox by replying to the notification email. Instead of deleting a discussion when it’s wrapped up to remove clutter, you can now mark discussions as resolved so you can go back later and see how the discussion played out. 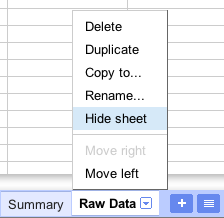 We’ve added a heap of frequently requested features to Google spreadsheets over the last few weeks. 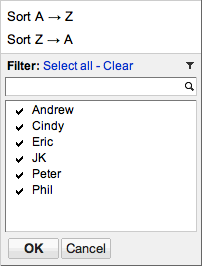 First, you can now filter spreadsheet data to hone in on rows that match criteria you set as filter options. 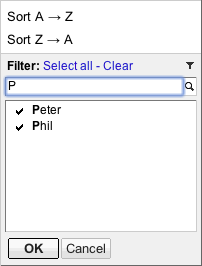 For example, a sales manager could choose to view transactions processed by Peter and Phil, but not those managed by Andrew, Cindy and the rest of the sales team. 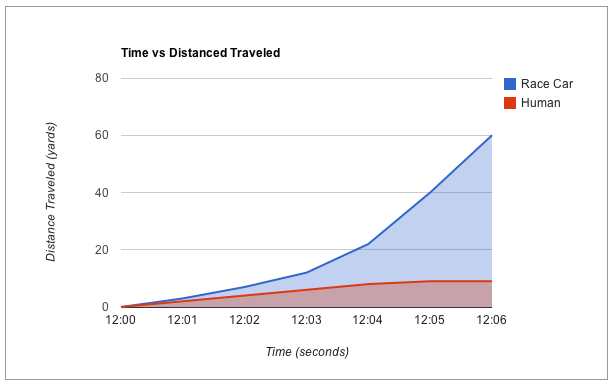 We’ve also improved charting in spreadsheets by making it possible to plot non-contiguous data. Multiple chart ranges help you create great charts without rearranging your data. 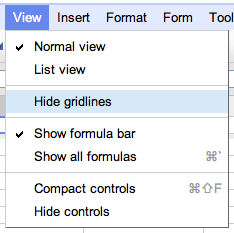 In addition, you can now hide cell gridlines or entire sheets in Google spreadsheets—giving your spreadsheets a cleaner look by removing extraneous formatting and data from view until you need it at a later time. As we continue to add functionality to Google Docs, many people are finding that that they no longer need software-based word processing, spreadsheet and presentation software. And now we also have an alternative for people who want streamlined collaboration but aren’t quite ready for 100% web productivity tools. Google Cloud Connect for Microsoft Office brings multi-person editing, automatic backup and complete revision history to Microsoft Word®, Excel® and PowerPoint® in Microsoft Office® 2003, 2007 and 2010. By bringing this functionality to existing versions of Microsoft Office, organizations can work more efficiently with the software that they’ve already paid for and implemented. Chances are, you get lots of email from newsletters, group mailing lists, account alerts and other automated systems. These messages aren’t spam, but they’re probably not your most important emails either. To help you separate and organize these kinds of messages, we introduced the Smart Labels feature in Gmail Labs. 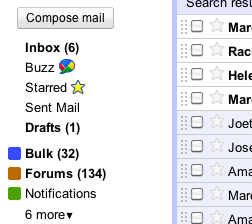 Once you turn on this feature from the Labs tab in Gmail settings, Gmail will automatically categorize incoming Bulk, Forum and Notification messages and label them appropriately, removing clutter in your inbox to help your most important messages stand out. We’ve also made viewing attachments in Gmail faster, easier, more affordable and more secure by adding browser-based attachment viewing for 12 more file types: .XLS, .XLSX, .PPTX, .PAGES, .AI, .PSD, .DXF, .SVG, .EPS, .PS, .TTF and .XPS. 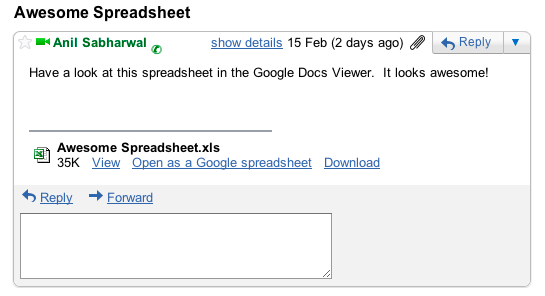 So instead of downloading attachments and then opening files with software you may or may not have for each format, you can just click the “View” link next to the attachment in Gmail. This will instantly display the attachment in your browser—no software required. To help customers see the productivity benefits of Google Apps at a glance, we recently introduced a new collaboration dashboard. 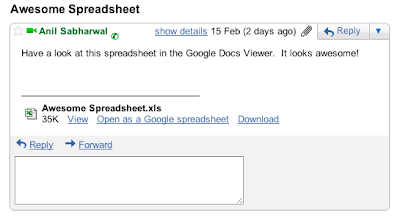 From the Google Apps administrative control panel, IT managers can view insights about how their users are working together with Google Docs. This dashboard offers a new level of transparency that traditional software can’t offer, and we think this kind of information will help businesses invest in technologies that actually get put to use, not software that—according to customers—sometimes sits idle after being installed. Our customers love Google Apps for lots of reasons, but the ability to rapidly get new features—like the ones described in this post—without having to install complex patches or upgrades rises to the top. Instead of large, disruptive batches of new features that only come every few years, people see a continuous stream of better functionality week after week. Still, some customers with more complex IT environments have asked for a bit more advanced notice so they can prepare for what’s coming. For these organizations, we’ve introduced a new release process for Google Apps features. Customers can choose to get new features immediately when they’re available, or have at least a week to prepare for new features after they’re initially introduced. Along with this new choice, we’ve launched whatsnew.googleapps.com, where customers can learn more about new features in the process of being released. 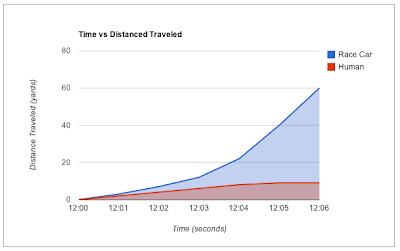 The pace of new customers coming onto Google Apps continues to accelerate among schools, businesses and other organizations. In the world of education, we’re happy to welcome the University of Alberta, Anhanguera Educational and thousands of other schools to Google Apps. In fact, over 50 percent of the NCAA® Championship bracket has gone Google! We also invite you to read how businesses and government agencies including Dominion Enterprises, Macomb County Circuit Court and Clerk, Revevol, Mad Genius, Cadillac Fairview, Sun Windows, Hammock and The Standard Agency are saving money and helping workers be more productive with Google Apps, joining more than 3 million other businesses that have gone Google. If domains are using a Single Sign-On system, then the administrator is responsible for this authentication system so are not affected. If admins are using a password-sync solution, then please ensure that the system is sending hashed passwords to Google. If it’s sending hashed passwords then users are not affected by this new requirement. If the password-sync solution is sending plain-text passwords, then this is not recommend and the domain will be affected by this change. Please note that this change only affects new passwords and password resets, not any existing passwords. User Managed Storage is a service that has allowed users to purchase more storage space when they fill the allotted quota on their personal Google Accounts. Over the next couple of days, we will be rolling this service out for Google Apps users as well, allowing the purchase of extra storage for Google Docs, Picasa Web Albums, and photos from Blogger. Any of these products that is over its storage quota can use the extra storage on a first-come, first-served basis. Users that upload lots of files to Google Docs, sync their Office documents to the cloud using Google Cloud Connect for Microsoft Office, or store and share pictures using Picasa or Blogger can now expand the storage space available for these files. Additional User Managed Storage cannot be pooled or transferred to another Google Apps account and cannot be used for Gmail. User Managed Storage is enabled or disabled by the domain administrator, and the end user purchases additional storage using his or her Google Checkout account at the domain. Data stored within User Managed Storage is subject to the same ownership policy as other data in the Google Apps account. Please note that this functionality is only for Google Apps domains that have already transitioned to the new account infrastructure for Google Apps accounts. This change does not affect any domains that have not yet transitioned to that infrastructure. – In order to allow end users to purchases individual storage, administrators must first enable the service ‘User Managed Storage’ in the ‘Organisation & Users’ -> ‘Services’ section for their administrative control panel. Google Checkout must also be enabled for the domain so that end users can purchase the storage. -If the ‘User Managed Storage’ service is allowed, end users can purchase additional storage at https://www.google.com/accounts/b/0/PurchaseStorage. – Google storage purchases are non-refundable. You can upgrade storage plans for the pro-rated difference at any time but paid storage for one Google Account cannot be transferred to a different account. A new setup wizard in the administrator control panel is now available for new and existing Google Apps domains. The interactive guide can walk you through all the key configuration options, from creating user accounts to activating email, migrating your existing data to Google Apps and configuring mobile devices. The wizard includes progress indicators so that you can easily come back to the setup tab to continue where you left off. 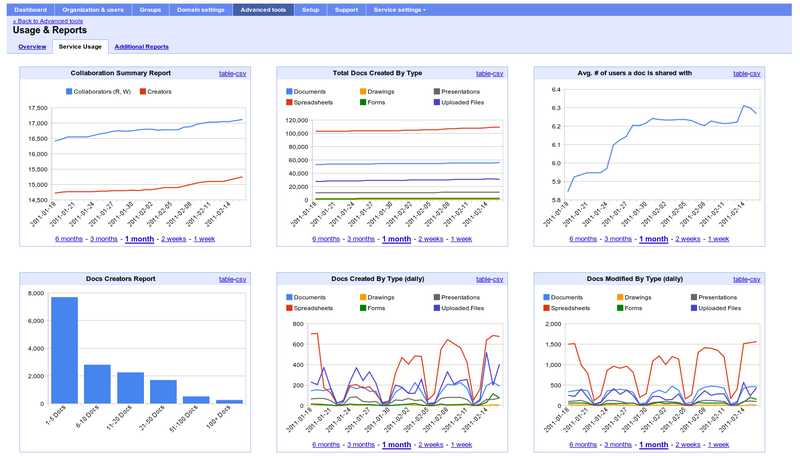 In the administrator control panel, select the new ‘Setup’ tab to see the new setup wizard. Note: The control panel must be set to the ‘next generation’ version which is US English only but we hope make the wizard available in more languages very soon.